Use round planters that are 1" smaller in diameter than stand width. We have maintained the old, European "wrought iron garden" theme while also putting a modernized twist on the look. The sleek metal legs provide a modern feel, while the design of the planter holder stand has a more contemporary look that will suit any house, patio, deck, or garden. Our product is so diverse, you can put it anywhere and it will fit right in. Whether you want to show off a beautiful cactus in your home or office or add some "umph" to your garden or porch, this is the perfect flower pot holder for you. This heavy duty pot stand is designed to prevent from toppling over and causing a mess. This item also comes with rubber foam pads for the feet to keep everything from slipping or moving. They also double as a protectant of potential scratches and scuffs if placed on floors. Your plants need oxygen to thrive. By putting your plants on a high service, this optimizes the flow of oxygen which can keep your flowers lasting longer and looking brighter and healthier. This product comes with simple instructions to put the trivet together. It is also easy to take apart so you can bring it inside during cold winters or if you want to move it to a different spot. We purposefully made a product that would be easy to put together. A CHIC AND ELEGANT DESIGN The Thorne&Co Plant Stand is a funky, modern take on classic flower pot stands. The base is made of galvanized steel that has been powder coated a black and its rustic, metal legs match just about any planter theme and decorum in your home. Our product adds a touch of class wherever you put it, and the quality make and design means any house guest would appreciate the craftsmanship. The tall legs help display your plants better so your guests have more to awe about. 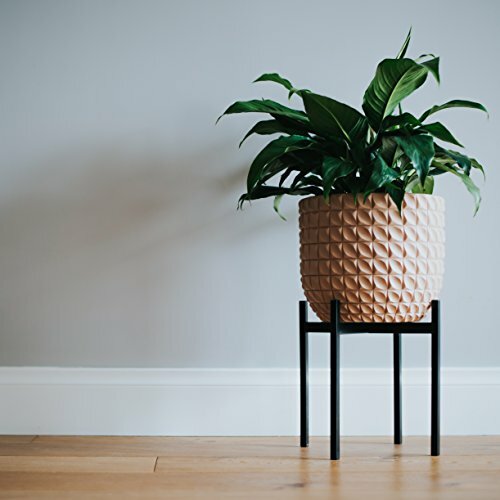 LESS MESS Ideally, large potted plants tend to need a base to keep them from falling or being knocked over, particularly if you have kids or pets in the home. Furthermore, pots have a tendency to leak, leaving behind water and soil on the carpet and floors. With our free standingly plant holder, worry no more about stains and grime on the carpet. The Ebony Stand is durable so you don't need to worry about anything from kids and animals to outdoor winds knocking the plant over. ELEVATION KEEPS YOUR PLANTS HEALTHIER AND LIVING LONGER Flowers and plants can be quite pricey and a pain to continually replace, which is why you want your plant life to live as long as possible. Our free standing flower and plant display isn't just a great purchase because of its decorative touch; it also helps your plants live longer and look more luscious. These stands provide plantlife with better air quality, helps reduce pollutants and improves humidity levels in the air. INCREDIBLY DURABLE AND EASY TO ASSEMBLE THORNE&CO created such a stable, quality product, you can keep it outside on the patio or in the garden and not worry about it tarnishing or breaking. The main parts of the stand is made from galvanised steel that has been powder coated matt black. There are black plastic stoppers on the top and bottom of the legs as well as four sticky rubber floor protectors. This rust-resistant, heavy duty item is also easy to assemble with just a few quick steps. CAN FIT MOST SIZED POTS These plant pot supporters were designed to fit most shrubbery. These are generously sized so there is plenty of room for larger plants and it can withstand more weight than many other trivets on the market. Whether you have a small tree, a cactus, herbs, or houseplants, this pot trivet not only can hold these items, it also adds more design to the inside or outside of your home. Our product showcases your greens beautifully. If you have any questions about this product by Thorne and Co, contact us by completing and submitting the form below. If you are looking for a specif part number, please include it with your message.